After a “soft opening” on the European Aluminum Association website, the Aluminum Association officially unveiled the 2015 joining update to its automotive manual Thursday. The American Aluminum Association wrote the manual with the help of the Aluminum Extruders Council and the European Aluminum Association. “It’s been a really excellent collaboration,” Kaiser Aluminum engineering and technology Vice President Doug Richman said of the American-European association partnership on the manual. Richman is also a former chairman and current member of the American association Transportation Group. Besides joining aluminum to aluminum, the manual will tell shops and manufacturers how to join the metal to materials like composites, magnesium, plastics and steel. The association pointed out a Ducker Worldwide survey (detailed here by the association) that expected more than 75 percent of new pickups in North America to be made of aluminum. 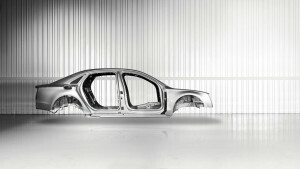 About 200 million pounds of aluminum sheet for vehicle bodies were used in 2012 — and that’s expected to grow to four billion pounds in the next decade. “Everybody is using some or all of them,” he said of the techniques in the manual. The chapter on arc welding is still in progress, Richman said. There’s some controversy over the instructions inside among the collaborators.